Emotional self-control is a character trait not often associated with babies but it is during infancy that the training begins. A study from the University of Montreal documents babies displaying self control in various settings and it seems they remain calm and content longer when they hear adults singing rather than speaking baby talk to them. Professor Isabelle Peretz, a faculty member at the university’s Center for Research on Brain, Music and Language, devised a two-part study to examine a baby’s level of distress. Her study’s findings suggests singing to irritable infants or when a baby is placed in a stressful situation is more effective than talking to it. Thirty healthy babies between six and nine months of age and a parent of each were recruited for the study that took place in a quiet room with black walls, low lights, and no toys, one baby at a time. Once the baby was settled into the study space, the parent moved behind the baby so s/he was out of sight and no longer touching the baby. 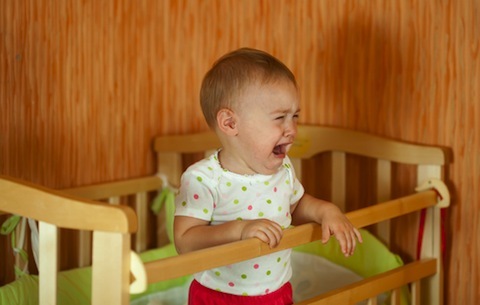 Researchers recorded the time that elapsed between the beginning of each audio format to the moment the baby displayed a “cry face,” described as a lowering of the brows, lip corners pulling to the side, opening of the mouth, and raising of the cheeks. Just under four minutes when adult speech was played. Just over four minutes when baby talk was played. Approximately nine minutes when singing was played. The research team expressed surprise at finding so little difference between the babies’ responses to both styles of speech and that the babies maintained composure more than twice as long when hearing a lullaby, even in an unfamiliar language. In the same setting, each baby was played recordings of a woman speaking baby talk in French and another of her singing a French lullaby. Again, the babies maintained self-control longer when listening to the lullaby than even baby talk in a familiar language. The study’s findings are expected to be especially valuable when emotional circumstances or adverse socio-economic situations challenge a parent’s ability to maintain self-control. Instead of ignoring or mistreating an irritable baby, singing a lullaby may produce a more satisfying outcome for infant and parent alike. Corbeil, Mariève, Sandra E. Trehub, and Isabelle Peretz. "Singing Delays the Onset of Infant Distress." Infancy (2015). Wiley Online Library. Web. 11 Nov. 2015. "Singing calms baby longer than talking." EurekAlert! University of Montreal, 27 Oct. 2015. Web. 11 Nov. 2015.